227 (13 Aug 1944), 228, 229, 230, 231, 236, 238, 245, 246, 247, 249(A), 251, 252, 253, 254, 255, 256, 259, 266, 267, 268, 269, 270, 273, 274, 275, 276, 279, 280, 281(A), 283, 284, 285, 286(A), 291, 292, 293, 296 (31 Jan 1945). (A) Mechanical problem aborts - no mission credits. For mission dates and targets see Mission Reports. 1Lt George E. McCutcheon (P) - First two missions (227, 228) flown as CoPilot with an experienced combat orientation Pilot. All others flown as First Pilot. Completed 35 credited missions combat tour on 31 Jan 1945 (Mission 296). 1Lt Benjamin Star (N) - Flew on 31 credited missions with 1Lt McCutcheon (All of 1Lt McCutcheon missions except 291, 292, 293, 296 where substitute Navigators were used). Flew on three missions with other Pilots (244, 287, 289). Completed 35 mission combat tour on 19 Dec 1944 (Mission 288). Bombardiers - The 1Lt McCutcheon Crew had no regularly assigned Bombardier and used utility Bombardiers or Toggliers on all credited missions: 2Lt Frederic Kiesel (B) (WIA) (7 missions - 227, 228, 229, 230, 231, 236, 238); S/Sgt Jack O. Severson (Tog) (4 missions - 245, 254, 255, 259); Sgt Keith E. Day (Tog) (14 missions - 266, 267, 268, 269, 275, 276, 279, 280, 283, 284, 285, 291, 292, 293), 2Lt Robert F. Nugent (B) (3 missions - 251, 253, 256); Sgt Edward P. Kedzierski (Tog) (2 missions - 273, 274); Others on single missions (5 missions - 246, 247, 252, 270, 296). 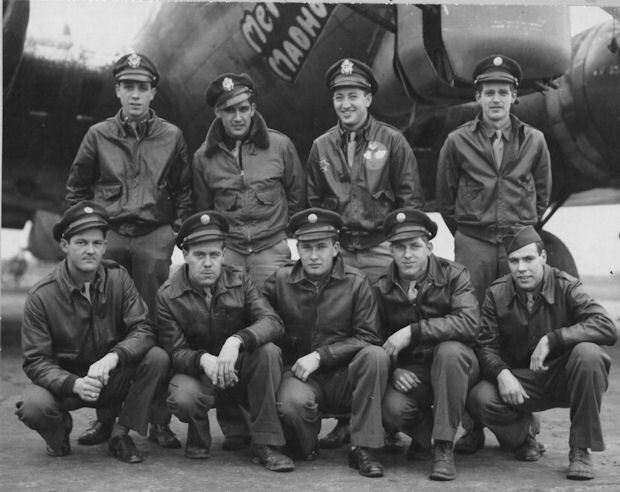 T/Sgt John O. Burcham (E), S/Sgt John C. Alexander (R), S/Sgt Donald H. Foulk (BTG), S/Sgt James E. Aberdeen (WG), S/Sgt George R. "Russ" Kinsman (TG) - Flew all of their combat missions with 1Lt McCutcheon. Completed 35 credited combat missions on 30 Dec 1944 (Mission 293). Eighteen B-17Gs flown by 1Lt McCutcheon on his 38 Dispatched combat missions: Flew no combat missions in the crew photo B-17G Mercy's Madhouse. See our Nose Art for photos of the named B-17s. Mission 229, 15 Aug 1944, to Wiesbaden, Germ - The 303rd BG(H) lost nine low squadron formation B-17s on this mission - Seven from the 358th BS and two from the 427th. Germany fighter attacks were centered on the Low BS formation .The McCutcheon Crew was one of two 358th BS B-17s that returned to Molesworth. Mission 238, 9 Sept 1944 to Ludwigshafen, Germ - A chunk of flak tore into the nose compartment occupied by Bombardier 2Lt Frederic T. Kiesel. It nearly severed his right arm, pierced his hip and threw him into the corner of the Fort's nose, unconscious and bleeding severely. He came to in time to release his bomb load. Flak knocked out two engines and shattered the plexiglass nose as 1Lt Kiesel was bending over his equipment. Aware that the Bombardier was wounded and seeing the rest of the formation begin to drop their loads, T/Sgt John O. Burcham, Engineer, shouted "Salvo" into the interphone so the plane's bombs could be dropped on the target. 2Lt Benjamin Starr, Navigator, grasped the emergency bomb release which is used when the Bombardier's switch is damaged. Before the Navigator could operate the emergency release, Lt Kiesel regained consciousness, dragged himself backed to his station, released the bombs, and then collapsed with the fingers of his left hand locked in a vice-like grip around the bomb release lever.. Lts George E. McCutcheon, Pilot, and Richard L. McGilvray, CoPilot, brought the crippled Fort back to an emergency landing in France. Lt Ben Starr, Navigator and T/Sgt Burcham applied first aid to Lt Kiesel and made him as comfortable as possible. Red flares shot out of the B-17 brought an ambulance and took Lt Kiesel to an aid station and his arm was later amputated. Lt Kiesel was awarded the Silver Star Medal for his heroic actions on this mission.